Let you know tomorrow, on the 'dude where's my car' challenge. Well today's commute was an odd one. Here it was my day off, and I go into work to teach a single student (off the clock...) and I got lunch, and a bottle of wine for it. Traffic wasn't all that bad either. I'm locating all my cold-weather gear for the commute tomorrow. Temps in Chicago are near Zero F.
Let's try the math again. I don't commute full time, often needing the truck for some errand or other. In 2017 we had a banner winter and twin newborns, so my commuting really didn't kick off til spring. Still, I managed to beat 1000 miles. If my work and family circumstances remain stable, I think I'll manage to do better than that in 2018. This is not a resolution or a campaign promise. But this is important to me... due to my bum ticker, working out is difficult enough to do much less make time for, and this is how I do it. First commute for the year down under, 20C at 6AM, going to be 36C for the trip home so a little toasty. First ride in. 13F/-11C with little to no wind to deal with. Toes were pretty cold but my fingers did ok. I was suprised to see a few bikes and runners out. Finally said good morning to a guy I pass almost every day. 2 or negative -6... I was too hot! Too many layers. My glasses was all fogged and frosted though, time for ski goggles! Only going to ride every other day for a while, have a bathroom to remodel. Happy New Year and Happy New Thread everyone! I think today may have been the coldest I've ever commuted in at 9F. I would have like a second layer on my legs as my knees and calves got cold. I shortened the ride a bit and made a warming up stop at the Panera about a 1/2 mile from the office. That was nice and I felt much warmer once at the office. I put on new tires (Gatorskins) last night to start off the year. And some brake pads too. Ready to ride! Oh, this morning a couple of co-workers were talking about the cold and how nice it is that one of them has a car with remote start, heated seats and auto-defrost. Ha! Danged cold even here in Georgia so I wheeled out the fairing bike, for the first time in months. Usually I'd do some maintenance first and generally go over it but I just checked the tires and left. Front tire is rubbing lightly against something, and I had forgotten that I wanted to replace brake pads, but otherwise a good ride. At first it feels dangerous to go out in 12° dressed for 40°'s, so I couldn't resist carrying an extra vest in case I had to stop. It's due for a re-design because it feels less aero than previous iterations, but I'm not really sure where I want to go with it. Maybe I'll just fix the shape of parts that I know for sure are hurting performance, without a full rebuild. First commute of 2018 and broke my cold riding record by 1 degree, -11F. About 20 minutes in I remembered saying after the -10 ride that I wouldn't do this again. The combination of temps, snow and ice, studded tires, and first ride back after 7+ days off made for a tough morning. Think I might bus it home! My first commute of 2018 was 14 degrees F, and only 4 miles to the station, so not too bad, though there was a wicked wind. I was on my folding bike, with a Shimano Alfine 8 speed hub, and the hub did not like the cold. I'd had the bike indoors overnight, so the hub started out warm, but within a mile it started skipping occasionally, and by the time I got to the station it was freewheeling in some gears. Not good! It thawed out on the train, though. I'm happy that it "warmed up" this morning to a balmy -12C/10F ("Feels Like" -22C/-8F), which is better than it was at midnight, -26C/-15F ("Feels Like" -36C/-33F). Snow was hard packed so relatively easy to ride on, I'm comfortable dressing for these temps so that part was easy too. It'll get a bit milder later this afternoon with snow too. Tomorrow similar to today and thankfully, I'm taking off Thursday/Friday as they're forecast for -32C/-23F and -30C/-19F respectively. Bought a Moose Bicycle 2018 Fat Bike 2 just after Christmas: regularly $1,798 (with accessory), on sale for $1,099. Should arrive next week some time, can't wait but then, I guess I have to. I brought the Paramount today again. Not so much about bookending the year this time, just that it’s presently wearing the MTB’s SPD’s. No photos of this for fear of C&V wrath. I took the longer but higher speed route clockwise around the lake. Happy new year to all! No commuting miles for me yet due to wussing out in the cold weather. This week might be a wash since it’s supposed to snow tomorrow. Maybe Friday might be a bit better. 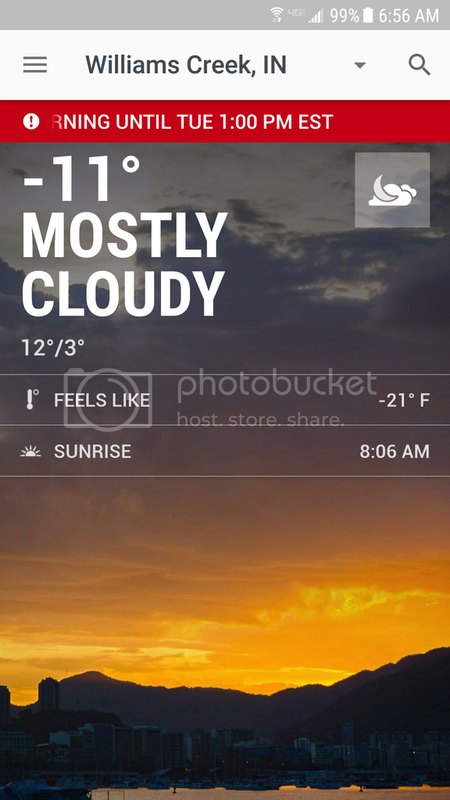 A bit warmer today at 19F. I wore an extra layer over my legs and was much warmer. I decided to take a shorter route home yesterday and in this morning just to limit my time out in the cold. It seems I'm good for about 10 to 11 miles before I start getting cold, so I took an 11 mile route. This did seem to help. I saw two sets of deer about 4 miles apart. Just when the second group caught my eye, I ran over something that sounded metallic. I never saw it and it didn't seem to hurt anything, but had me worried that a flat was on the way. Warmer this morning at 10F but I didn't ride. The MUP is a mess and my ride home yesterday was brutal. A friend agreed this is the worst we've seen snow maintenance (or lack thereof) in almost 10 years. Some sections are perfectly cleared while others are hard packed, rutted ice. Might be the first time I've wished for a fat tire bike to soften the ride. I had a twitter battle with DPW yesterday and in the past public shaming has caused them to act. Hoping to get back on the bike tomorrow. Happy 2018 all. I finally got around to commuting yesterday. 12 degree F start temp, and a balmy 18 by the time I got to work an hour later. My cycling has been very spotty since summer 2017 due to prolonged work trips, sporadic/long hours, working from home, taking time off, tiredness, laziness, etc...I've been looking forward to the new year starting to start riding more. I got out twice over the holidays to ride (mtb and group road ride), but things were too busy to get out any more than that. So, yeah, yesterday felt challenging. I got winded and tired easily. I wasn't fast. I'm still a bit sore/fatigued. BUt it was a good day and good ride. Today I drove (weather fx is maybe some snow this afternoon?) and planning on riding tomorrow. I gained weight during my hiatus from regular riding, and right now that is my motivation. The wife and I are going to S Korea this summer, and I would like to slim down by then. My first commute of 2018! Unbelievably cold temps here in the Memphis area. This morning it was 18F. I have said previously I would only ride down to 20F, but I decided to brave it anyway since I have my e-bike and wouldn't be out in the cold as long as I would on the road bike (which is currently torn down to bits anyway). Hiking boots with wool socks, thermal tights and sweat pants, base layer plus sweatshirt and lined softshell jacket, balaclava, and I broke out the ski goggles once again. The goggles never worked for me before, but I thought I would try them again since I've had less fogging issues on the e-bike. I did end up with a little bit of moisture, which then froze, and obscured part of my right eye vision. Luckily the goggles stayed clear on the left half, thankfully, since that's where my helmet mirror is. My main issue was that I was lacking wind blocking in the "nether regions" which became painful towards the end, when I arrived at the office. 15 miles took right at 1 hour total time. This afternoon will be above freezing for the first time since Saturday so hopefully it won't be as painful. I'll confirm this one for you. I drove through Indianapolis last Sunday (coming from Dayton, OH heading west) and I remarked to my wife how the interstate was in pretty good shape until we hit the city limits, at which point it was obvious no plowing had been done. I cut down 38th street between the freeways to stop for gas and the side roads were equally unmaintained. Then once I was back on the interstate heading west on 74 the road conditions improved again as soon as we reached the edge of town. Last edited by Tundra_Man; 01-03-18 at 10:25 AM. You should get some windblocking pants. I know Uniqlo sells some nice looking chinos that block wind. I was able to snag a great set of thermal, windblocking bib pants last year when a shop was closing down for all of 60 bucks. Previous to that, I just had a pair of thermal cycling pants without the windblocking. I'll never wear those in extreme cold again! I try to wear more "normal" clothes on my e-bike since it's a comfy, upright ride. But I thought the thermal tights and sweat pants would be enough. Guess not. Might need to stuff a plastic bag down my pants or something. I drove through Indianapolis last Saturday (coming from Dayton, OH heading west) and I remarked to my wife how the interstate was in pretty good shape until we hit the city limits, at which point it was obvious no plowing had been done. I cut down 38th street between the freeways to stop for gas and the side roads were equally unmaintained. Then once I was back on the interstate heading west on 74 the road conditions improved again as soon as we reached the edge of town. That's embarrassing, but good fodder for twitter! First commute of 2018 which thankfully coincided with the first morning of positive temps we've seen in over a week. Anyway, back to work this morning. 2F air temp with an 11 mph head wind made for -14F wind chill. I dressed too warm on top as I put a sweatshirt on between my work shirt and my windbreaker. The rest of me was about right. I did have some issues with my goggles icing over. The only effect I've noticed with the "Cat Crap" I bought last month was to slightly lighten my wallet. Nearly two weeks off the bike, and the daily feeding frenzy I had during our travels really made their effects apparent. I felt like I was breathing unusually hard just to maintain a pathetically slow pace.